The purpose of technical writing is to help users do the right thing and do the thing right; quickly and easily. As technical writers, how do we ensure that the content we create is helping users do this? 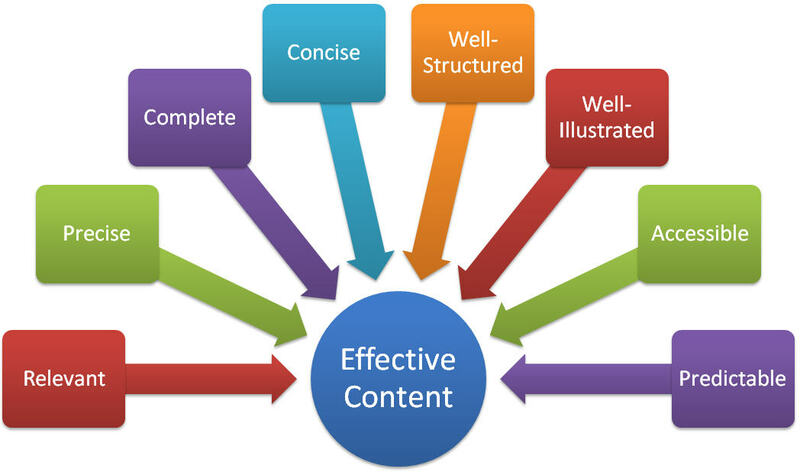 Well, let us look at some characteristics of effective technical content. Relevant. The information provided must be what the users are looking for. Providing design specifications to the end-user would not be of much use, would it? Precise. The information must be unambiguous and accurate. You don’t want the users to wonder what something meant or do something wrong. Complete. The information should be complete within the defined context and scope. Ensure every process and procedure is complete as are all the explanations. You wouldn’t want the users to wonder what to do next. Concise. The information should be crisp and to the point, yet complete. The users should be able to read the information and get what they want quickly. Remember, users refer technical documents as and when they need information or help. Well-Structured. The information should have a logical flow that helps users understand it quickly. Complete the puzzle for the user; don’t ask the user to put the pieces together. Well-Illustrated. The adage of a picture being worth a thousand words is very relevant to technical writing. Use illustrations, screen shots, tables, icons and similar graphic elements where possible. Accessible. Users should be able to locate the information they are looking for quickly and easily. This is why technical documents have headings, Table of Contents, Index, cross-references, links, etc. Remember, users refer technical documents. When was the last time you read a user manual from cover to cover? Predictable. Similar information should be structured and presented in a consistent manner. For example, if you have an overview at the start of a procedure, ensure all procedures have such an overview. Similarly, do not use and to indicate something that the user should not do. Choose and use one of the icons consistently. Want to learn how to write clear, concise, precise content? Enroll for our Certificate Course in Technical Writing. Can the ‘Predictable’ be called ‘Consistent’. I’d say, I want the document ‘consistent’ and not predictable. Apart from that the article is good. Thanks for sharing.